Below is the video of the debate organised by Academics for Palestine and hosted by the TCD Irish School of Ecumenics, which took place in Trinity College Dublin on Wednesday 12th November 2014. Speakers supporting the Boycott were Palestinian academic Ghada Karmi and Israeli academic Ilan Pappe, and opposing it was British academic Alan Johnston (who was given double time as no other speaker could be found despite many attempts). The evening was chaired by Newstalk’s Shona Murray. Many thanks to USI Live Ireland for filming the event. 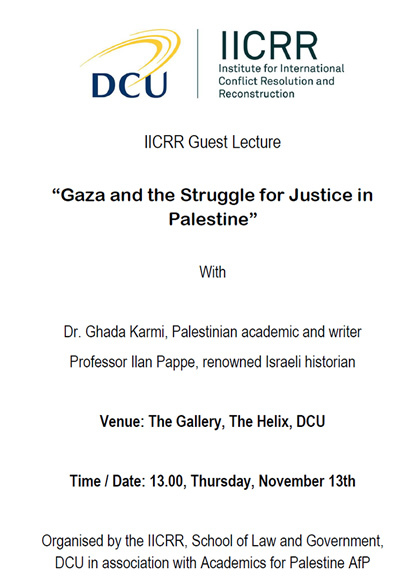 Academics for Palestine has organised the below meetings on university campuses around Dublin this week with guest speakers Palestinian writer and academic Dr. Ghada Karmi and Israeli historian Prof. Ilan Pappé. This series of college meetings on Wednesday and Thursday this week will examine the role of academics in the struggle for justice in Palestine. This includes a public debate at Trinity College Dublin on the subject of the academic boycott. The meetings are detailed below. 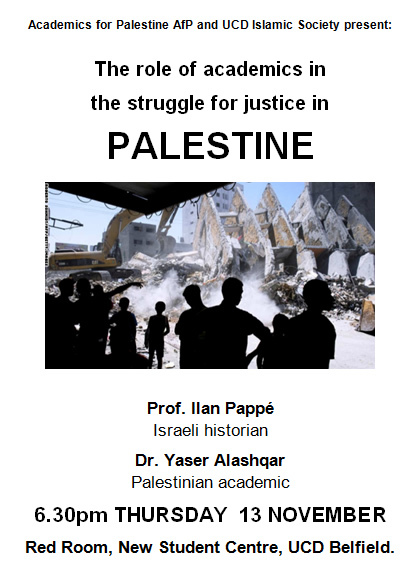 Prof. Ilan Pappé; the leading historian of the origins of the state of Israel, is the author of seminal works includingA History of Modern Palestine and The Ethnic Cleansing of Palestine. Born in Haifa, Israel, where he lectured for many years, he is now a professor at the University of Exeter, UK, and one of the leading Israeli advocates of boycott, divestment and sanctions (BDS) against Israel. 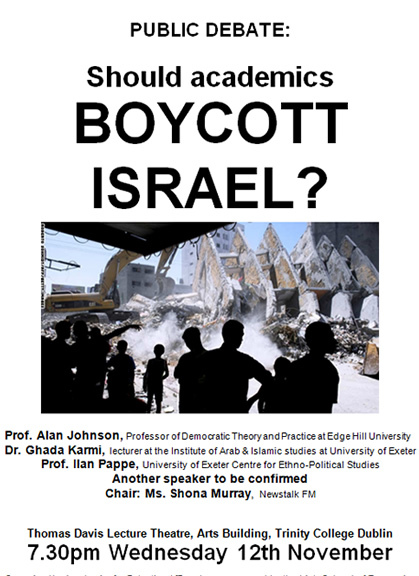 Public debate – “Should academics boycott Israel? 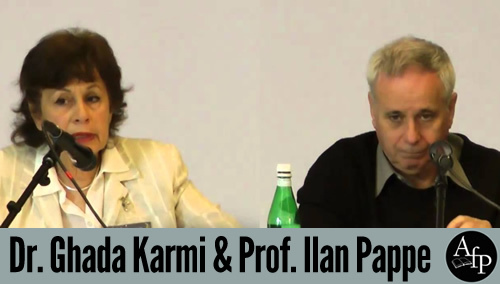 Speakers: Dr Ghada Karmi, Prof Ilan Pappé, British political theorist Prof Alan Johnson. At least one additional debater will be added to the programme. 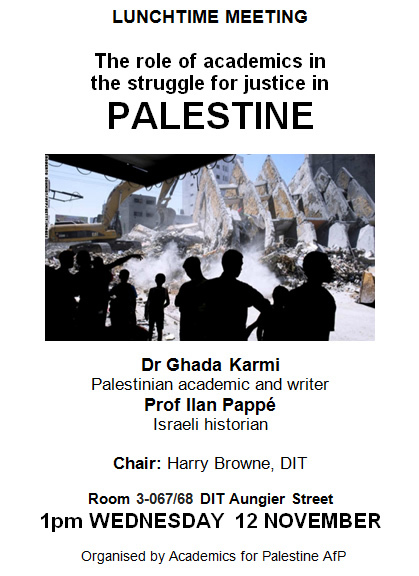 The debate, hosted by the Irish School of Ecumenics at TCD and organised by Academics for Palestine (AfP), is open to the public and admission is free.